Koh Bon is located 40km north of the Similan islands but still considered part the mu ko Similan national park. It’s a very different dive site to the Similans because it’s a limestone rock not granite. You can see different underwater colours here and the seas around are full of different nutrients for the marine life to feed on. 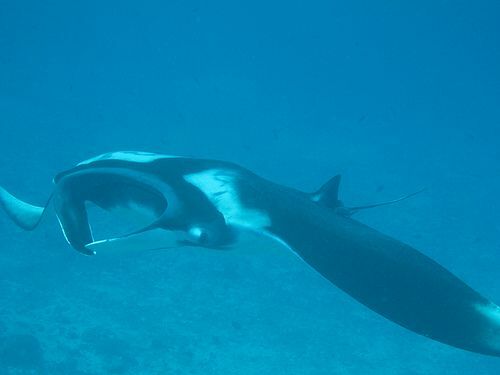 The most popular visitor that comes here to feed is the manta ray. Koh Bon is one of Thailand’s best locations for spotting manta rays (Koh Tachai, Hin Daeng and Hin Muang probably get just as many mantas). Day trips to possible to Kon Bon, speedboats depart from Khao Lak, but it’s better to dive by liveaboard boat. In peak season Koh Bon can get very busy with dive boats. There are moorings in the bay to the south but dives rarely start from this point. Visibility is generally very good. Currents can be fierce so this is not a dive for inexperienced divers. Often down currents are present and divers must pull themselves along on rocks. Of course the manta rays love the currents to feed in. A dive on Koh Bon west ridge usually starts on the south wall that drops vertically down to about 35m. Sometimes mantas are in this area at cleaning stations. The wall is covered with encrusting sponges, zigzag clams and seafans. Moray eels and their cleaner shrimps abound. Octopus and cuttlefish are common. Whitetip reef sharks often cruise by in deep water. As divers move west along the wall the west ridge becomes visible as it sharply drops off to below 40m. Currents will get stronger here and it may be necessary to hang on to something while you peer into the blue looking for mantas. If you do see them do not chase them, you won’t even get close. It’s much better to hang back and let them swoop over you. It often seems like they enjoy playing with diver bubbles. It may be possible to carry on with the dive around to the west side where there is a staghorn coral garden or currents may make it necessary to return along the southern wall and end the dive in the bay. The southern wall is an excellent night dive location as coral polyps open up to feed and create beautiful picture. Octopus, lobster and crabs can be seen on the wall along with millions of shrimps. To the west of Koh Bon island is Koh Bon Pinnacle which is an advanced dive for experienced divers only and can only be dived when conditions allow. The pinnacle starts 18m below the surface and drops down to 40m. The west side of the pinnacle is a steep wall covered in yellow soft corals. This pinnacle is a magnet for large pelagics like manta rays, eagle rays and black tip reef sharks.